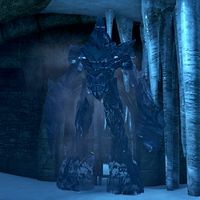 The Dread Atronach is a frost atronach found in the Vile Manse. It will stand still and cannot be fought until a number of frozen skeletons have been defeated. This page was last modified on 4 October 2016, at 17:23.